How Pull-up and Pull-down Resistor works? 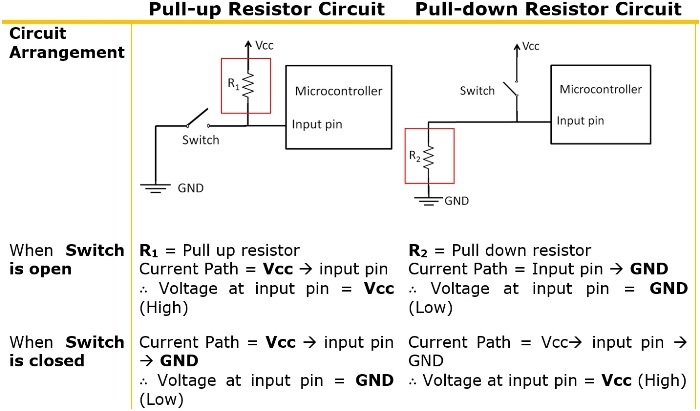 Let’s discuss How Pull-up and Pull-down resistor works in Electronic Circuit. These resistors used when a constant voltage is required at Input pin of a digital device (for example, Microcontroller). When there is nothing connected to the pin of microcontroller, it is difficult to tell the status of pin i.e. either High (pulled to VCC) or Low (pulled to GND). This uncertainty of pin status is called floating. A switch can be used in between GND and input pin, to avoid floating condition. This solution to floating pin has one problem, as shown below. Hence to avoid both floating and short circuit situation pull-up and pull-down resistor is used. This will make pin status steady as either high or low, and also maintain small current in circuit path. The name pull-up/down is only related to the arrangement and functionality of resistor used. It does not mean shape/size/composition of resistors. Before selecting resistor value, we need to keep in mind following relation, “Low resistance–> More current–> Strong pull-up/down–> More Power dissipation & voltage drop” and vice versa. So, a resistor value should be selected such that, it will provide good amount of current, good pull up/down, with lowest possible power dissipation and voltage drop. All these design requirements can be fulfilled by 10K – 100 KΩ pull up/down resistor. Now we hope you understand how Pull-up and Pull-down resistor works in Electronic Circuit. This is it for now and in next post, we’ll learn about variable resistors and its use cases. Next What is variable resistor?